by Vicky Neale. Published on 3 October 2016. I was recently given a copy of Crafting Conundrums: Puzzles and Patterns for the Bead Crochet Artist by Ellie Baker and Susan Goldstine. This was pretty exciting for me, as although I knew nothing about bead crochet (I’d never heard of it), I’m a mathematician who enjoys exploring mathematical ideas through craft. So naturally I rushed out and bought lots of beads and thread, and a very tiny crochet hook (1.5mm, if you’re really interested). And then I realised that it would probably have helped if I knew how to crochet—which I didn’t. Still, it’s important not to be deterred by minor obstacles, so I pressed on. I had several evenings where the process was: get started, crochet for a bit, realise it wasn’t right, undo it, and repeat until bedtime. (With hindsight, at least some of the problem was that I started with a 1mm crochet hook and this led to tension problems, in every sense of that phrase.) But eventually I figured it out, and made a few bracelets for friends and family using designs from the book—Escher-inspired tessellations, mostly. Even as I crocheted lizards, I found myself wondering: what would a bead crochet bracelet illustrate about the distribution of the primes? And since you’re now wondering about this too (if you weren’t already), let me show you a picture. I should probably explain what you’re looking at. 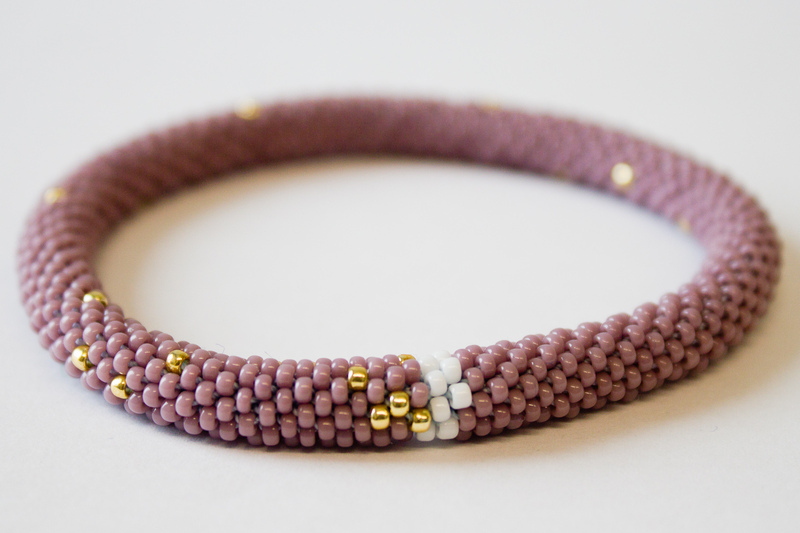 To make a bracelet like this, you start by threading on all the beads you need for your project, in the right order. So I sat with a list of primes up to 1,000, and a pile of gold beads (for primes) and a pile of white beads (for non-primes), and got threading. Then you start crocheting in a straight line, incorporating one bead in each stitch (apologies to people who actually know about crochet, I don’t know the technical terminology). When you’ve reached the `circumference’ of the bracelet, you join the most recent stitch to the first, to form a small circular loop, and then you spiral round on that to build up a long tube. When it’s the right length (when you’ve used up all your beads), there’s a clever grafting technique to join one end to the other pretty seamlessly to form a beautiful torus/bracelet. The bracelet above has a circumference of 6. I’ve marked the start with black beads. If you look very carefully to the left of those, you can see two adjacent gold beads, corresponding to the primes 2 and 3 (these are the only adjacent gold beads because…). Then there’s a white bead for 4, then a gold for 5, then it goes round the back, and the next prime we can see in this photo is 11, down and to the left of 5. Since the circumference of the bracelet is 6, each loop round takes 6 beads. Do you see there’s a little flurry of primes with five gold beads in a straight line, corresponding to the arithmetic progression of primes 5, 11, 17, 23, 29? Neat, huh? Naturally, I wanted to look at the primes on a bracelet of circumference 7, to compare and contrast, so I rustled one up. The start is marked by the dark blue beads, and just to the left you can see two adjacent gold beads, for the primes 2 and 3. The sequence continues upwards on this photo, so 4 is above 3, then we have the prime 5, then it loops round the back, and the next prime we can see is 11, immediately left of 3 in the photo. Two things strike me about the 7-bracelet compared with the 6-bracelet. One is that the gold beads no longer land in two nice neat spirals. The other is that there seem to be a lot of pairs of primes that differ by 8. Intriguing. Now, I could tell you things about the distributions of the primes (both known results and unsolved problems) based on these bracelets, but really the point of this article is to encourage you to make your own bracelets, because you’ll find out a whole lot more that way than by my writing things, and you’ll end up with a piece of jewellery at the end of it! I’ve thought moderately carefully about prime numbers, and I still feel that I got a richer insight into their behaviour by threading on beads and crocheting them into a bracelet than I have done by staring at lists of primes. I recommend it! Just one tip. Fired up by my success with the primes, I made a 7-bracelet of squares. This was not a good idea. By the time you get to squares in the 900s, they’re pretty thin on the ground, so it was quite boring to crochet: lots and lots of unchanging purple beads… Also, I don’t think it looks very pretty. I’m a huge fan of the square numbers, and they give rise to a lot of interesting mathematics, but disappointingly they did not give rise to an interesting bracelet. So, now it’s your turn. What will you bead crochet first? Vicky is the Whitehead Lecturer at the Mathematical Institute and Balliol College, University of Oxford. Her job involves enthusing about mathematics to anyone who will stand still for long enough. In her spare time, she enjoys various forms of craft, and her cats are always keen to help.